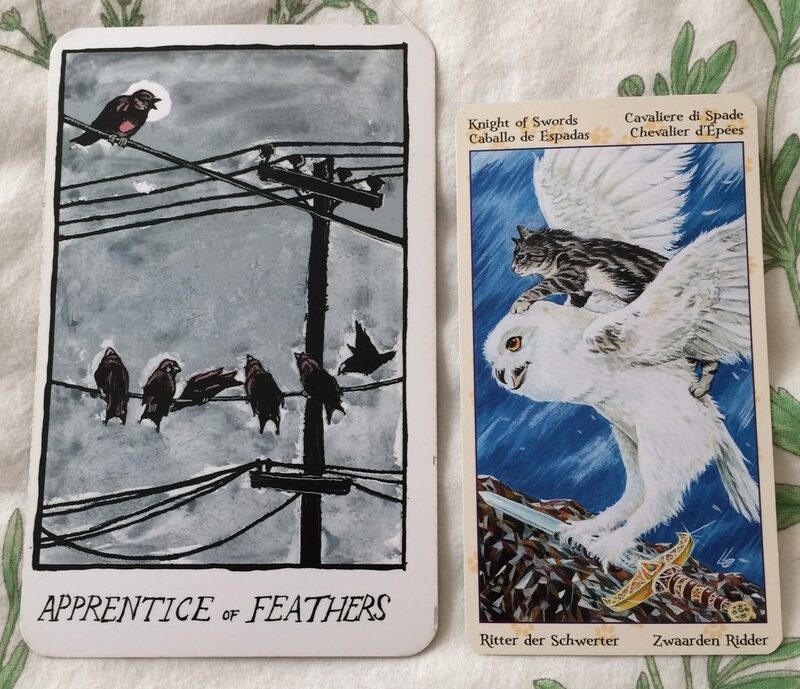 Apprentice of Feathers from the Collective Tarot: A bird sits perched on a power line above six other birds. They all seem to be listening to what the first bird is squawking on about. 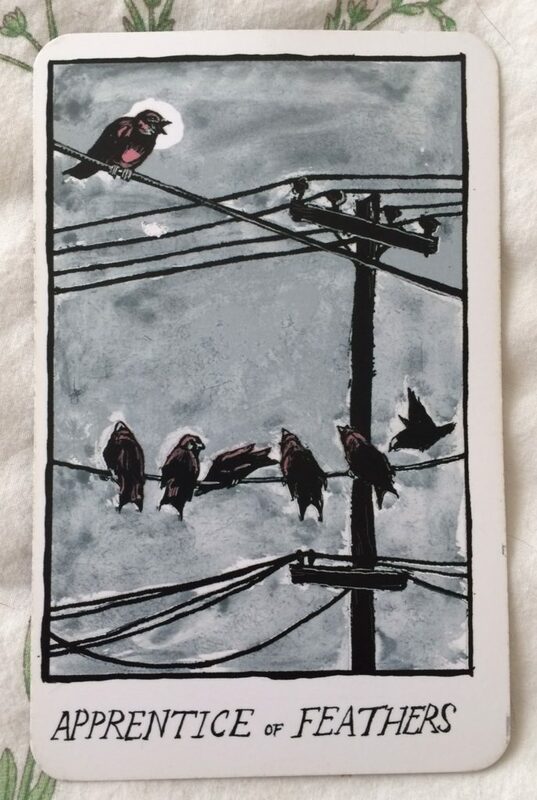 The Collective Tarot says, “This is you wielding your power, even if you are unsure of it. Speaking with authority, even if you are still learning.” It is vulnerable thing to open yourself up to criticism. That’s OK. You can’t wait until you’re perfect at something to take action. It’s OK to fall or fail. Then again, this image also reminds me of that white dude who takes up a ton of space rambling on and on and not actually saying anything. It may be the person whose social capital allows them to be listened to even when they have nothing of import to say. Are you that person in this situation? Can you recognize this behavior in someone you know? This is a far less active card than most traditional interpretations. Knight of Swords from Tarot of the Pagan Cats: This card is bonkers. 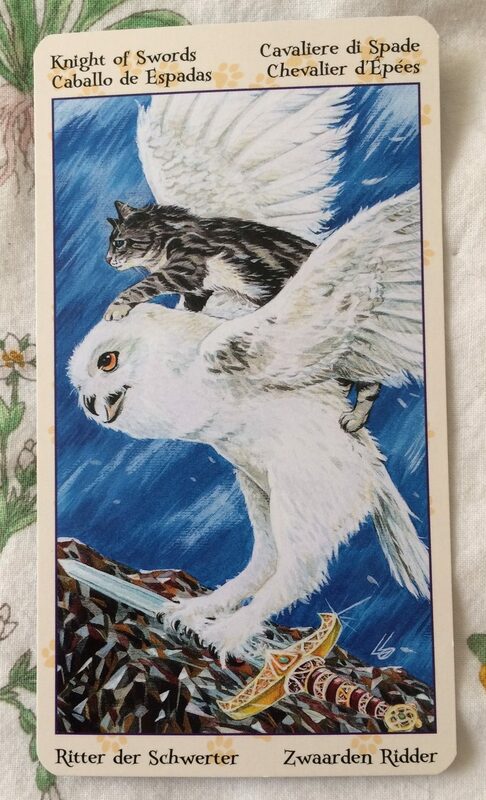 A white owl grips a sword while flying with a cat rides on its back. Am I looking at confidence here, or overconfidence? There is definitely momentum: get going! If you’re inspired, start working! Of course, you may be forgetting (or willfully ignoring) obstacles or problems that may be in your path, but who cares, right? This can either turn out OK or be disastrous, but the card won’t tell you that. I see this as a more short-lived version of the Chariot. Tons of momentum and energy pushing you forward. While you may have the reins of the Chariot, you probably won’t have that level of control when the Knight of Swords shows up. There’s a feeling of inevitability with this card. Even if it comes up in a reading and you haven’t started moving forward yet, you will…and quickly. You may have to deal with negative repercussions due to your haste, but you can worry about that later.